A friend found this online and thought of me. 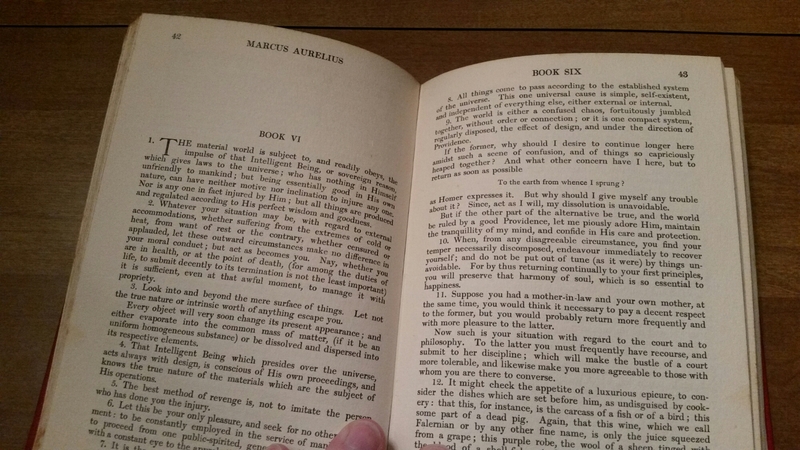 Appears to be a 1905 edition of the Meditations. The paper is a really interesting quality, and it’s the Graves translation. Until now, I did not have one. 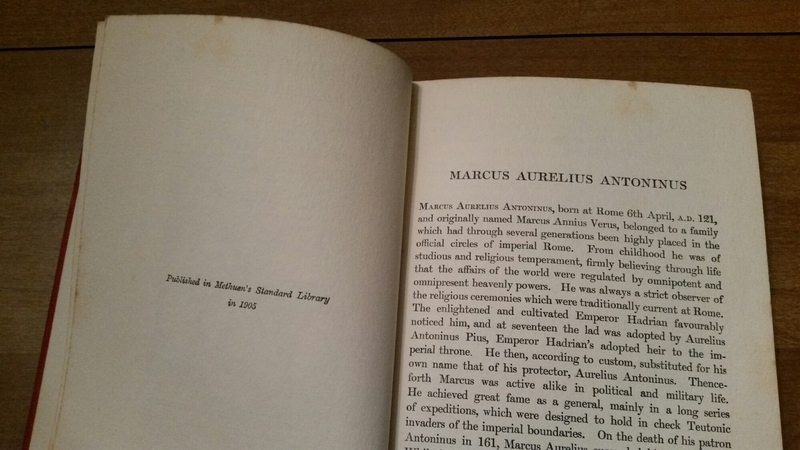 The pages don’t have much white space, and that helps make a tidy little volume. The text has section markers, and notes beginning and ending of chapters and books. A pretty neat find. Thanks, buddy! Tucked away in Buckhannon, WV. It’s pretty interesting the things one comes across. This street is located in a small WV town, about 5,600 people. But even here, at some point at least, someone remembered a “little Phoenician” who synthesized a philosophy which helped shape the West. In Buckhannon WV, this street is tucked away not too far from a small Methodist college. I’d be interested to learn when and by whom this street was named. There’s probably an interesting story there. If there’s ever going to be a location for an Appalachian Stoa, or a Stoic intentional community: we’ve found it. I picked up this leather bound, onion skin paper version of the first two Books of the Discourses, Enchiridion, and Fragments. 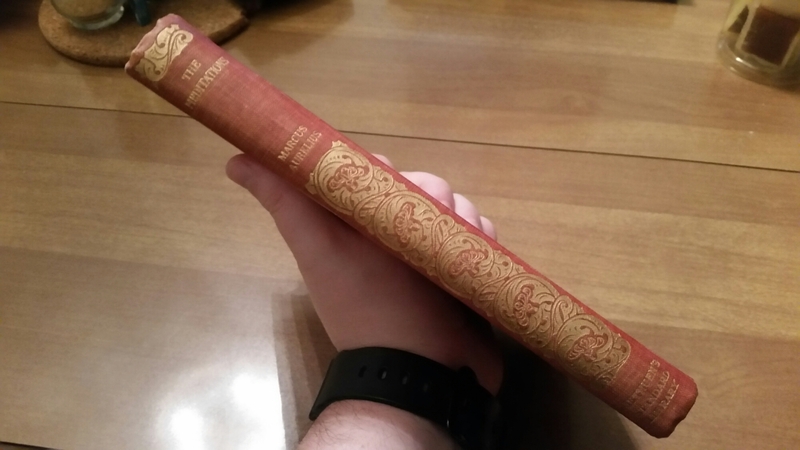 The inscription says 1924, which is pretty neat, and the printing itself might be 1890 (?). It was waiting for me in the mail when I got back home. Books 1 and 2, Enchiridion, and Fragments. I suppose the way that Stoics try to re-frame their perceptions and experiences of life would certainly seem funny from the outside. Sometimes, it seems funny from the inside. Michael has been posting videos of unique blend of comedy and philosophy for quite some time, but this is the longest special posted yet. Feel free to trundle over to the YouTubes, give him a watch, a like, and a share. The Stoic message is a powerful one, and new and creative avenues for spreading it are a good thing. Clearly, the reading plans have biased the frequency somewhat. Interesting to look at the frequency of words and topics, though.